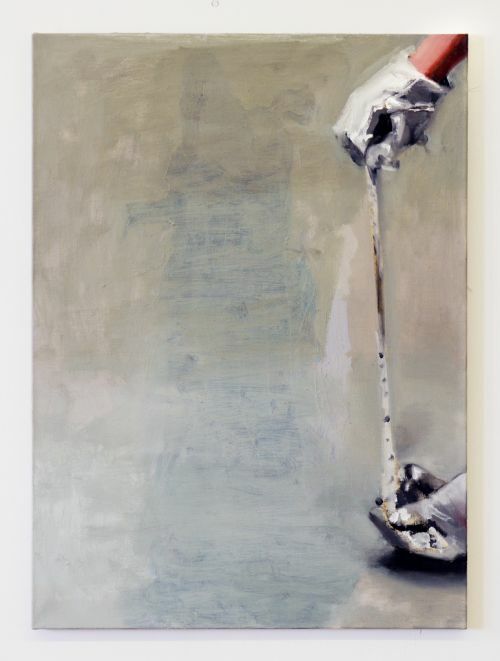 Image: Mark Neufeld Disappearer, 2012, oil on linen, 22″ x 30″. Photograph courtesy of the artist. Includes live performance at 5:00 p.m.
For additional performance dates/times please visit www.uwinnipeg.ca/art-gallery. Re-enactments is an exhibition of new and recent works by artist Mark Neufeld that explore painting, theatre, repetition, the found object, and borrowed aesthetics as a way of thinking about history and geographic place – specifically Winnipeg, and aspects of colonial-era Western Canada – that live on in the present day. As an installation, the assembled works will function as a theatrical mise-en-scène that will be “activated” periodically over the course of the exhibition, by the presence of actors, using a script that takes the historical re-enactment genre as its departure point. In 2011, Mark Neufeld moved from Vancouver to Winnipeg to accept a teaching position at the University of Manitoba School of Art. He has a Master of Fine Arts degree from the University of Victoria and a Bachelor of Fine Arts degree from Emily Carr University of Art and Design. Neufeld works with a variety of media, with painting as the starting point for his activities. His exhibitions often take the form of installations that interweave paintings with readymade objects, assemblages, and presentation strategies borrowed from the curatorial domain. Recently, the artist has positioned these features of the “expanded painting” vocabulary within the discursive framework of history painting. Here, the artist takes an active role in addressing aspects of the gallery as a site situated within broader networks of representation. Neufeld is the recipient of a number of awards and grants, in particular, the Joseph Plaskett Award, which was created to support Canadian painters for a year of living and producing art abroad. He has exhibited across Canada, in the United States, in Germany, Australia, and Norway. Neufeld’s most recent exhibitions include Performance with Two Sculptures at the Southern Alberta Art Gallery in Lethbridge, The Undiscovered Continent at Deluge Contemporary Art in Victoria, 55 Tschaikowskistrasse (along with Cedric Bomford) at Gallery Atsui in Vancouver, and The Greenhorn at Atelierhof Kreuzberg in Berlin. Gallery 1C03 hours: Monday – Friday: 12:00 – 4:00 p.m., Saturday: 1:00 – 4:00 p.m. Closed December 14, 2014 through January 5, 2015 inclusive.